The Benson Clean and Beautiful Committee has been arranging the painting of historic murals on blank walls around Benson for the past few years. They have commissioned artist Doug Quarles to do the paintings. You can also see his work at the Quarles Art Gallery on the corner of 4th and Huachuca Streets (196 East 4th Street, Benson, AZ 85602, Phone: 520 686-2752). Section Gang Benson, AZ. Every Railroad had section gangs, also known as "Gandy Dancers",that maintained the tracks and made needed repairs. Each gang was responsible maintaining many miles of track. Southern Pacific Caboose built in 1960. This caboose was donated to the City of Benson in 1994 by Southern Pacific Railroad and sits on the corner of 4th and San Pedro Streets. San Pedro and Southwestern Railroad is Benson's very own local short line that runs from the Union Pacific junction at highway 80 and 4th Street south 8 miles to Apache Nitrogen Products. They also run a trans-load spur here in Benson from their offices on Country Club Drive. Freight from railroad cars can be loaded and transferred to trucks for local distribution. 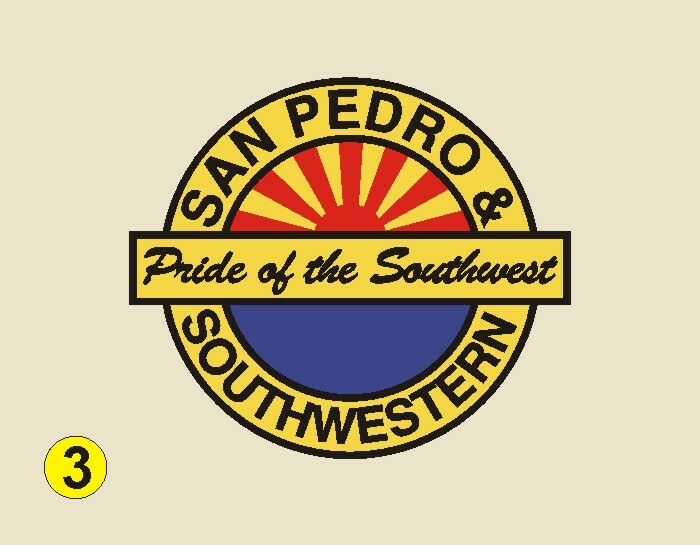 The two steel logos were donated by the San Pedro and Southwestern Railroad. Benson's Depot. 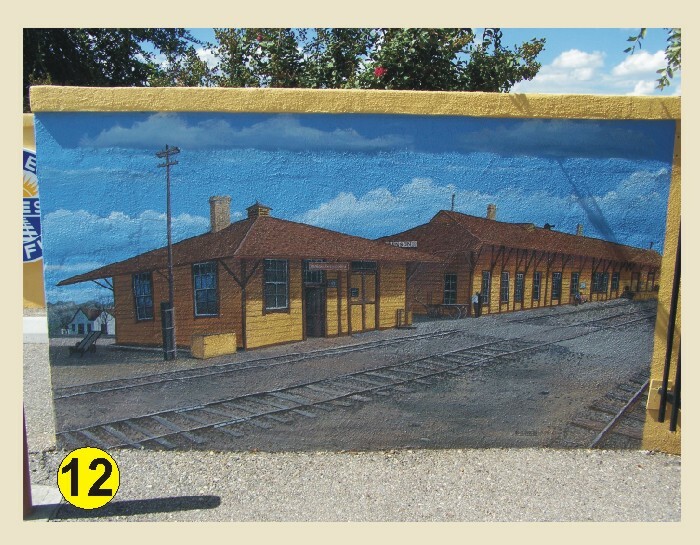 This mural was painted from a post card of the depot's North side looking West. circa 1912. Union Pacific Logo 1895. You can see the only difference between the 1895 logo and the logo used today is the Overland Route lettering in the center. These steel logos were all paid for by a grant from the Union Pacific Railroad Foundation. This Round House image was painted from a 1903 photo. The eight-stall Southern Pacific was built in December of 1898 and was sold and moved to Tucson in 1910. It was located near what is now the intersection of Highways 80 and 86 within 100 yards of the Union Pacific underpass. The El Paso and Southwestern Railroad was active in the Benson area from 1901 until it was sold to the Southern Pacific actually ran from Tucson to Benson through Bisbee Douglas and on to El Paso, Texas with a spur line that went to Tombstone. The line from Fairbank to Tombstone was removed about 1960. These steel logos were all paid for by a grant from the Union Pacific Railroad Foundation. This was one of the first trains in Arizona. It was used to bring track and ties in the construction of the railroad. The line arrivethe 22nd of June 1880. The Atchison Topeka and Santa Fe Railway ran from Benson South to Fairbank and then west to Harshaw, Calabassas and Nogales before it went South to Guaymas, Mexico. It was put in back in 1881 and the line was traded to Southern Pacific Railroad in 1898. These steel logos were all paid for by a grant from the Union Pacific Railroad Foundation. This was a TW-3 class Southern Pacific Mastodon 4-8-0 steam locomotive built between 1889 and 1898. The photo this mural was painted from was probably taken around 1918 and this train was used until the late 1930s. The Southern Pacific Railroad Company first came to what is now Benson in June of 1880. The Pacific Improvement Company,the real estate people for Southern Pacific Railroad, actually laid out and built the City of Benson as a water stop on the southern route from Los Angeles, CA to New Orleans, LA. Southern Pacific Railroad was bought out by union Pacific Railroad in 1996. Although the Sunset Limited Passenger train started in 1883 was run by Southern Pacific Railroad, it was taken over in 1970 by AMTRAK and continues service from Los Angeles to New Orleans with a stop in Benson, AZ. These steel logos were all paid for by a grant from the Union Pacific Railroad Foundation. This Mural was painted from a c 1900 post card of the Benson Depot south side looking Northeast. The building in the foreground was built as the Wells Fargo Freight Office in 1885. Union Pacific Logo Today. Union Pacific Railroad was formed on July 1, 1862 under an act of Congress signed by President Lincoln. Union Pacific Railroad connected with the Central Pacific Line on May 9, 1869 at Promontory Pass, Utah creating the first transcontinental Railroad line Connecting the East coast with the West coast. Union Pacific continues operating today and just recently celebrated their 150 year anniversary. These steel logos were all paid for by a grant from the Union Pacific Railroad Foundation. Union Pacific Freight Train approaching Benson from the East. You can see the train is crossing the trestle at the San Pedro River. The trestle was built in 1929 after a flood washed out the previous bridge. The San Pedro and Southwestern Railroad Tourist Train ran from Benson to Charleston from 1994 to about 1998. This mural was painted from a photograph taken back about 1996. The red passenger cars were 1937 Pullman Daylight Passenger Cars" purchased from the Fort Bragg, California Tourist Train in the early 1990s. The Daylight Passenger Cars originally ran from Los Angeles to San Francisco from the late 1930s into the late 1950s. Benson had it's own ore refining plant called Southwestern Smelting and Refining Company. It started in 1881 and went out of business in 1889 re-opened and closed several times until it finally closed for good in 1914. It was located just below the current day water tank. Mule Teams hauling copper ore from Bisbee to Benson at Mule Pass in Bisbee. The mules continued to haul the ore to Fairbank until the Arizona and Southeastern Railroad built track from Bisbee to Fairbank in 1888. This mural was painted of an 1880's Prospector. This Train Mural was drawn from a 1903 photograph looking east from the corner of 4th and San Pedro Streets, Benson, AZ. The buildings of the Southwest Smelting plant can be seen in the distance. Geronimo Steam Tractors were also used to haul copper ore and supplies from Bisbee to Fairbank. They found the steam tractors worked great until it rained. They would then go back to mules until the rains stopped.